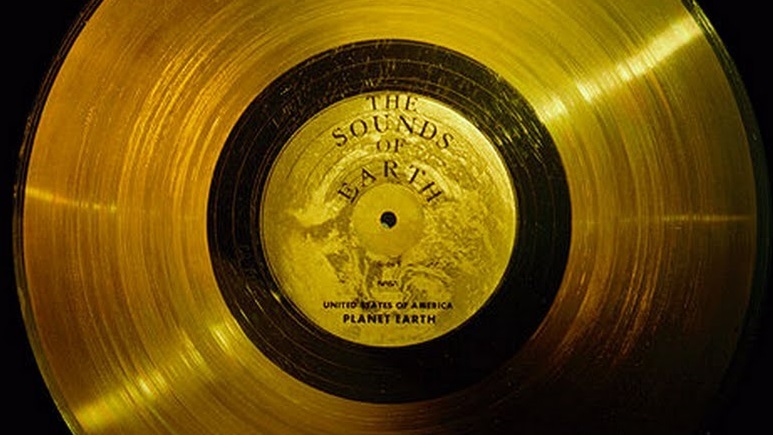 The Golden Record (1977) is a record made of gold and copper that is on each of the two Voyager spacecrafts, now well beyond Pluto, headed for the stars. It was the brainchild of Carl Sagan, his message in a bottle thrown into the cosmic ocean. One that will probably last at least a billion years. On the cover (pictured above) is a star map, showing when and where it came from, and instructions for how to play the record to get sounds and pictures. It assumes a knowledge of physics and mathematics at least as good as ours. A safe assumption since only beings able to travel between the stars are likely to find it. It also assumes they can see and hear. A not-so-safe assumption. 116 pictures (drawings and photographs). The pictures show the Earth and other planets and many scenes on the Earth itself. They show how big humans are, what they are made of, what they look like inside and out, things they do, things they make, and so on. Calibration picture. Matches the one on the cover. Star map showing when and where the Golden Record came from. Mathematical notation that will be used. Units of measurement that will be used. Common atoms and molecules found on Earth. Jupiter. The Voyagers gave us way better pictures. Children and a globe of the Earth, showing the same side as in the picture above. Continents through the ages – and the age of the Earth when humans lived (represented by the hand). Showing the size of humans and the perspective used in pictures. 1977: Voyager 2 and 1 leave Earth. 1990: Voyager 1 looks back and takes one last picture of Earth: a pale blue dot. 2012: Voyager 1 enters interstellar space. 2015: Voyager 1 is 4 times farther away than Pluto. Voyager 2 is 3.3 times farther. 2020: NASA starts to shut down Voyager 1’s instruments. 19,600: Voyager 1 is one light year away. 42,000: Voyager 1 passes within 1.6 light years Gliese 445, a star in the constellation of Camelopardis. 298,000: Voyager 2 passes within 4.3 light years of Sirius. 1,000,000,000: The Golden Records are probably still playable. Voyager 1 has travelled 57,000 light years, one third of the way round the centre of the galaxy. Asia: India (8), China (5), Iraq (2), Turkey (2), Armenia, Bangladesh, Burma, Indonesia, Iran, Israel, Japan, Korea, Nepal, Pakistan, Saudi Arabia, Sri Lanka, Syria, Thailand, Vietnam. Europe: Britain (2), Italy (2), Czech Republic, France, Germany, Greece, Hungary, Netherlands, Poland, Portugal, Romania, Russia, Serbia, Spain, Sweden, Ukraine. Only Eurasia is well represented. There are even five dead Eurasian languages (Latin, Ancient Greek, Hittite, Akkadian and Sumerian), but no Swahili. Asia: Azerbaijan, China, India, Indonesia, Japan. Europe: Germany (5), Austria, Britain, Bulgaria, Georgia, Russia. Americas: US (4), Peru (2), Mexico. Oceania: Australia, Papua New Guinea, Solomon Islands. A third of the songs come from the US and Germany. 5% of the languages used in greetings. 16% of the people in pictures whose race can be determined. Maybe some Borg like species will find this and come here to assimilate/rescue us from all of this intolerable freedom. But with my luck they’ll probably wind up being some WHITE supremacist Borg people from an all white galaxy looking for a species of a different color than them – to treat special! Unfortunately… the Aliens switched to CDs sometime in the mid 1990s. Today’s Aliens are wholly unfamiliar with the LP format and will end up using it as a rather expensive dinner plate. I must admit, I have strong feelings about this one, even though I know it’s not perfect. Sure it assumes a lot about the alien race (their physical and mental setup) but it’s kind of impossible to make any sort of a “space message” without any assumptions about the beings who’ll encounter it. What I’m (as an anthropologist) also interested in is the Golden Record as a time capsule for our own species. What kind of assumptions about humans and their societies does it make? What kind of representation? What would we change if Voyager was to be sent today? I know in the case of the Pioneer plaque, there is a lot of we can say about human figures (drawn by Sagan’s wife) – the man doing the hand wave and not the woman, both humans looking white – though I believe Sagan said it was his complain at the time, too (not the hand wave but the way figures are depicted – he wanted them to be “racially ambiguous”, whatever that means). All in all, I can’t help but having strong feelings about these things. Also, this might be one of the rare instances of… anything representing humanity where my language is included. The should have included more non Euro-Asian languages, though, but, ugh, I guess it’s a plus that not only Western languages are included. @ Fan… and King, very funny! .And how many EARTHLINGS read instruction manuals? Just for that, when/if the golden record, with instructions, reaches Vogsphere , Earth will be subjected to the third worst poetry in the universe. We should stop NASA. Actually, no. We shouldn’t stop them. If the radio waves travel into space, would there be a time delay with extra-terrestrial communication? Retroactive karmic justice- the Vogons can blast their back to the future poetry in medieval Europe. Africa has the babel fish. Vogons are a humanoid slug like alien race from Vogsphere in Douglas Adam’s Hitchhiker’s Guide to the Galaxy who are responsible for the destruction of Earth, to make way for an intergalactic highway. So what’s the purpose? I don’t understand. They trying to reach the ones not already here? Right, our radio waves travel way faster than the Voyagers, so anyone who finds the Golden Record could already know about us. In the Pioneer plaque, Sagan wanted the humans to look “panracial”, having a bit of each race. He wanted the man to have a short Afro. I vaguely remember the last photo of the woman in the produce section in the late 80s as a child. The grocery store stacked random novelty toy items right above the produce which would be an absurd idea now. Can’t believe nearly 30 yrs went by just like that. LOL .. There’s some stuff I could say in response to this, but I’m gonna chill for a moment! LOL. Many of the pictures do have a National Geographic feel to them. Thanks for the link! I wonder who vetoed this idea, then. I mean, it wasn’t perfect, I guess – the mere idea it’s possible to capture the “essence” of races is faulty as it is (because race is not a biological fact) but hey, at least they could have tried to capture something that would to us, here, look more diverse than two (blond?) white humans. EDIT: I think it’s important to note here that the bias in fiction is always towards white, as in, a fictional character (or artistic representation) is assumed to be white, unless it’s made explicitly clear that they are not. Most people, regardless of race, make this assumption. So, I think/hope Sagan’s heart was at the right place here but the bias worked against it because it was never made explicit that the humans depicted are not white. It’s a common problem in fiction writing. Sometimes, people will assume that a character is white even if they are explicitly described as POC (for example, Rue from the Hunger Games). Canadians are loons! I happen to believe they are here as I happen to be one! I am from Uranus!